The journey to better health can prove difficult, especially if you don’t have an accurate way to monitor and track your results. Losing weight, and specifically decreasing your body fat, can be easier if you have a method to keep up with your results along the way. A quality body fat scale can keep up with your weight, body fat percentage, and other key data. Some of these devices can also help you monitor your heart health, muscle mass, and bone mass. Most of these scales are highly accurate which helps you make the changes needed to get the results you want. 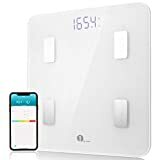 A digital body fat scale requires little space in your bathroom but can provide essential information that will help you achieve your health goals. Many of these scales can be synced to your wireless devices using WiFi or Bluetooth connections so you always have the information at hand. This can prove especially useful if you’re working with a doctor or other professional. The following are the top 10 best body fat scales in 017 based on reviews. The QardioBase Smart digital scale automatically measures your BMI and tracks the changes made in body composition as it weighs you. This device keeps track of the changes so that you can make adjustments to your diet or exercise plan as needed. It provides feedback that makes it easier for you to reach your weight loss goals. 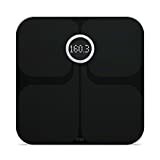 This digital bathroom scale from Qardio has automatic user recognition so that it can be used by everyone in the home. The device is easy to set up and use. It can be synced with your mobile device using the app so that you are always able to keep track of your goals and progress. This scale also has a pregnancy mode. 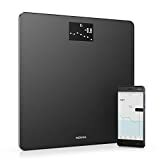 The Withings Smart Body Analyzer comes in a sleek black color. This device is able to measure your heart rate simply by stepping onto the scale. It also has continuous indoor air quality monitoring. It can be synced with your devices and will automatically upload your stats and progress using Wi-Fi or a Bluetooth connection. This digital scale uses the Health Mate app to help you keep up with calorie intake, improvements in your stats, and other important data. It has a scale interface that is designed to help you center yourself on the scale for the most accurate readings. 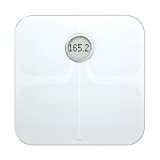 The Nokia Body Cardio body composition scale is helpful in keeping track of your overall cardiovascular health. It measures heart rate and uses Pulse Wave Velocity to track other aspects of the blood moving through the body as an indicator of heart health. The scale uses body position control technology to ensure that results are accurate. 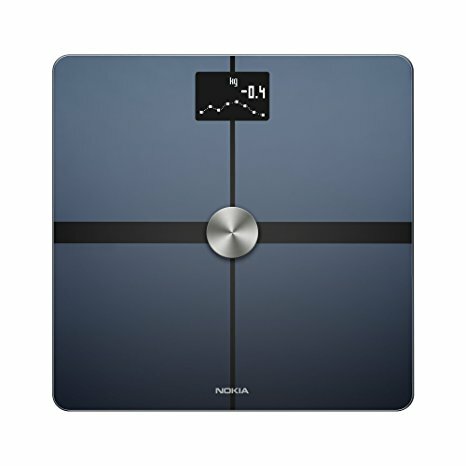 This digital scale from Nokia Health can provide full body composition analysis. It measures weight, body fat, water percentage, muscle mass, and bone mass. It also uses a weight trend screen to give immediate feedback that allows you to make changes as needed. 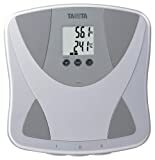 The Tanita Duo Scale and body fat monitor is a budget-friendly option that can help you keep up with your body fat composition. It also tracks your body water, weights, and lets you know where you fall on the range of health based on these statistics. The scale can store data for up to 2 users. It also has weight only options for other users or guests. 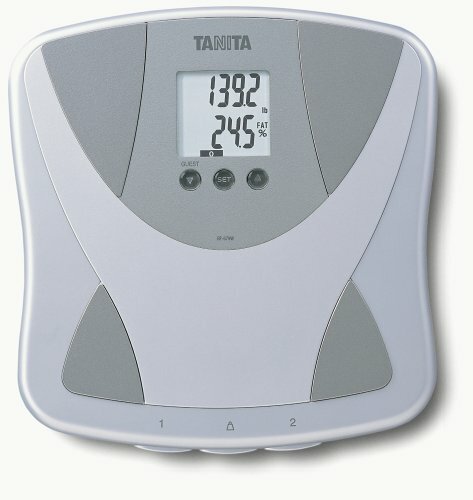 This scale from Tanita has a large dual-line screen that allows you to easily see your data. It has a 300 pound weight capacity. The weight is measured to the closest 0.2 pounds and body fat is measured to within 0.5%. This stylish white scale from Nokia Health uses position control technology to help you center your body on the device for the most accurate results. It has automatic synchronization using the Health Mate app so that results are available immediately on synced devices. This scale has a small profile, at less than an inch thick, so as not to require much storage space. 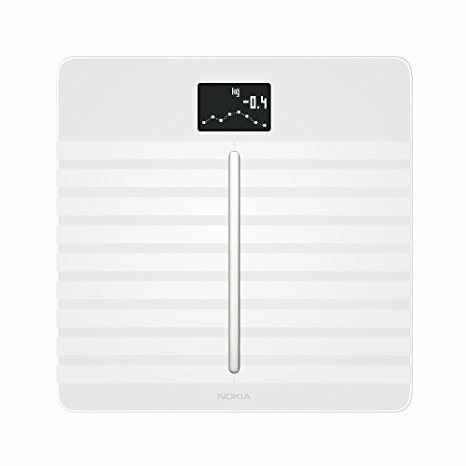 The Nokia Body Cardio scale can help you monitor your overall heart health while also keeping track of your weight loss progress. It keeps up with body fat, water percentage, muscle mass, and bone mass. It also shows a trend screen for instant feedback. 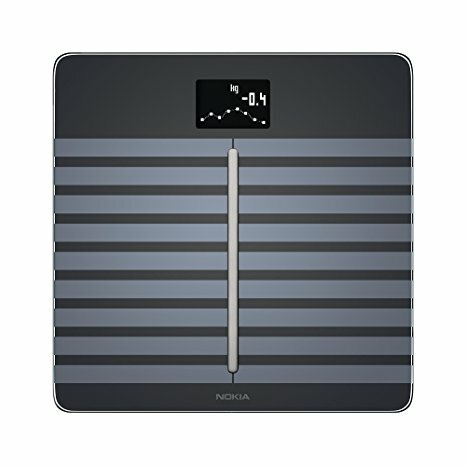 The Nokia Body scale is designed specifically to help with the fat and weight loss journey. 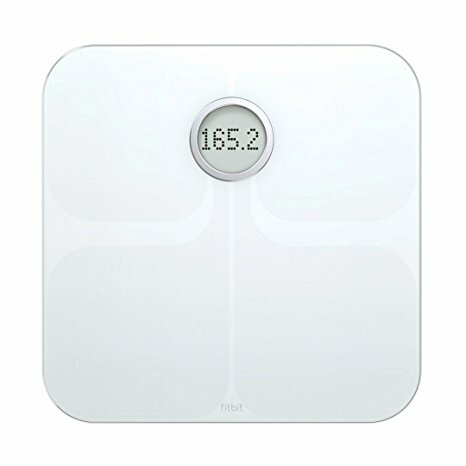 This scale gives instant feedback on your weight and shows weight trends over time. It can be used by several members of the family to keep track of their progress separately. This scale also has a baby mode and a pregnancy mode. This scale from Nokia will automatically synchronize with the Health Mate app so that you can have access to your data from a mobile device. It is able to track your BMI so that you can work with your health care professional to figure out a plan that will help you reach your weight and fat loss goals. This scale from FitBit uses 4 AA batteries. It is water resistant and is designed to be used in the bathroom without negative effects from the humidity. It measures your weight, body mass index, lean mass, and body fat percentage. 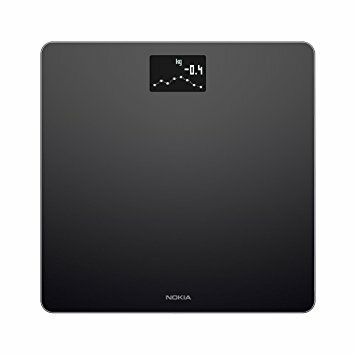 The Nokia Body WiFi scale can do a full body composition analysis. It keeps track of your weight, body fat, water percentage, and muscle and bone mass. This scale is ideal for those who are trying to reach a particular weight or body fat percentage and can be especially helpful for athletes. This scale from Nokia Health synchronizes with the Health Mate app so you can always have access to your data. It allows you to set a nutritional goal for the day through the app so you can manage your caloric intake. The scale also gives you a daily weather forecast when connected to your home WiFi network. 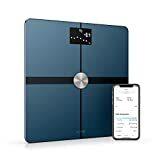 The Fitbit body fat scale uses BIA technology to safely measure your weight, water percentage, muscle ratio, body fat, and other helpful statistics. This scale is small and requires little space for storage. It has a large viewing screen that allows you to see your data the moment you step on the scale. This body fat scale from Fitbit has an auto power off feature to conserve battery life. It comes on as soon as you step on the scale without the need to tapping. The scale has a maximum weight of 400 pounds and shows your weight in .02 pound increments. 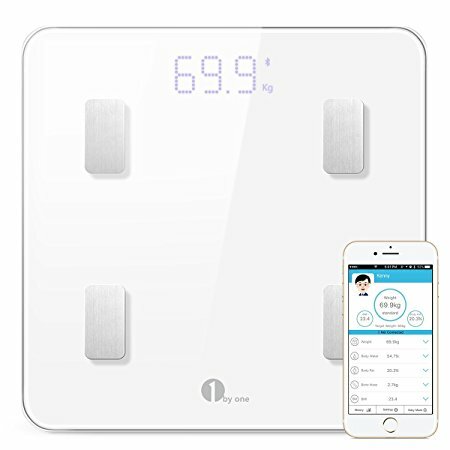 The 1byone body fat scale can connect to your mobile device via a Bluetooth connection. 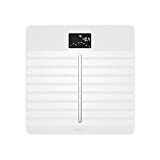 This budget-friendly scale uses BIA technology to track your body weight, body fat, water percentage, muscle mass, BMI, BMR, visceral fat, and bone mass. 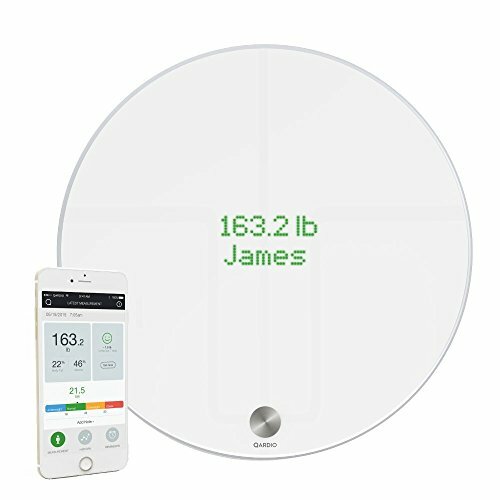 This scale from 1byone has stepped on technology so that you don’t have to tap or move the scale to make it work. It has a compact design that doesn’t require much storage space. The 3.3″ display clearly shows your data as soon as you step on the scale. When you’re trying to lose weight and build lean muscle, it can be essential to keep up with your body mass index. This can help you know when you’re making progress towards your fitness goals. By keeping track of things like muscle mass and water percentage in the body, you can make changes to your diet and exercise program as needed so that you’re able to reach your goals. A scale that helps you track this data can also be extremely helpful when you’re working with a health professional as you’ll always have accurate data to show them. 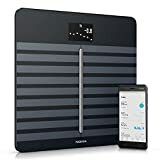 Many body fat scales are able to connect to your mobile device through a WiFi or Bluetooth connection. This convenient feature allows you to keep your data with you so you have access when you need it. Some scales can also sync with a health app that can show you ways to make changes to meet your goals. When shopping for a body fat scale, you can read reviews from other consumers to find an option that has the features you need most.